1) The sedimentation box traps all solids such as gravel, leaves and suspended particles in preliminary cleaning. A rubber seal ensures tightness at the edges while keeping a safe distance from neighbouring filtration. 2) The precleaned precipitation water is then routed via the granulate filter cushion which extracts organic and inorganic pollutants from the water. 3) The filtered water then flows back via the deflector plate into the free drainage section of the gutter. It is available for reuse, seepage troughs or for discharge into public water bodies. 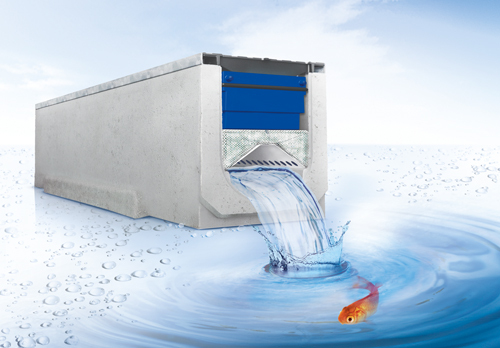 In contrast to conventional filtration gutters, BIRCOpur consists of separate modules: sedimentation box, granulate filter cushions and the deflector plate. The frequent exchange of filters due to the formation of filter cake is no longer required. 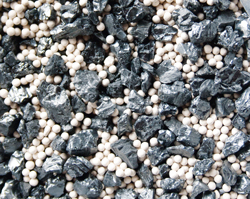 Solids like sand, leaves, gravel and suspended particles are trapped in the sedimentation box without reducing the filtering rate. 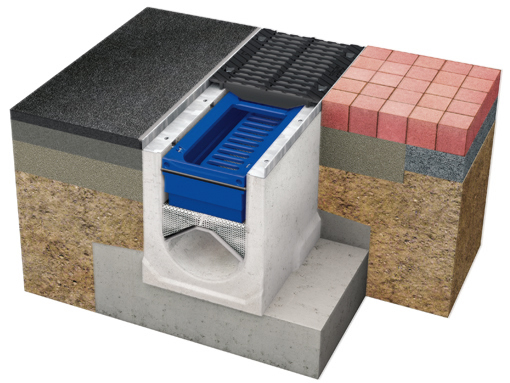 The benefit: the sedimentation box is easy to inspect, empty, flush and reinstall. The cleaning intervals depend on the given local conditions. 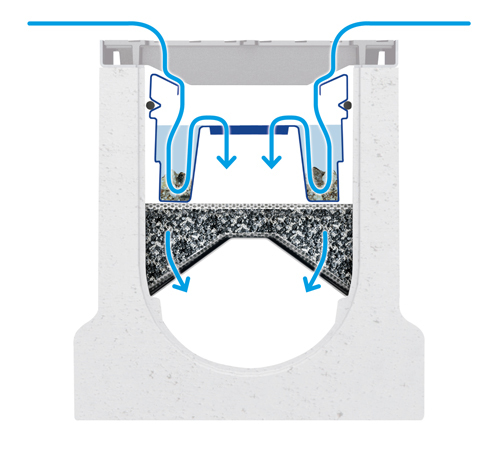 Fastening hooks in frame recesses ensure the optimal positioning of the sedimentation box in the gutter. Cross section BIRCOpur: The rainwater arrives at the filter unit only after preliminary cleaning in the sedimentation box. The cleaned and filtered water flows via the deflector plate into the channel. The rainwater already precleaned in the sedimentation box is routed over a cushion containing the filter granulate. Dissolved organic and inorganic pollutants are removed from the water by adsorption and precipitation. The cleaned water is then routed via the free drain to a collector point where it is available for further use or seepage. Thanks to prior preliminary cleaning, the heavy-duty filter granulate remains active for a long time. To ensure homogeneous grain distribution, the fine-grained granulate is incorporated into the filter cushion. The disintegration of the granulate package is practically excluded. The filter cushion must be replaced an average of every 10 years. High-quality filter granulate, usable up to 10 years.